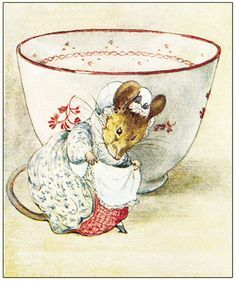 Beatrix Potter ... Tailor of Gloucester. Although I do not have a Simpkin cat to help me I felt like the tailor of Gloucester last week. Cutting out very carefully not to waste and of the precious fabrics. When I can get a nice length of fabric from my cutting (a little thin strip) then I use those too to tie up bundles of fabrics so really not even the mice get waistcoats poor things! I am really loving my stitching right now with the sea, butterflies (slightly neglected because of deadlines and the nature of the butterfly one is lots more complicated ) and the Winter one and yet another Winter one! ... it is glorious really glorious. The weather is holding and I am hoping it will for some time but I have really started to enjoy the thought of Autumn and Winter stitching .. Thank you Dawn - you inspired me so much, I am forever grateful! I have a Autumn work basket ready and the one thing that I have already made is the acorns from needle felt. I have cut leaves out as well and I have my design ready to stitch. You see I have embraced it all. Well what do you think, I am most happy with it and the way that it is coming along with all the detail in the stitching of it. The whale is pleased too!! If any of you are reading this blog in Canada please let me know where would be fabulous to visit for Stitching and quilting ... I would very much appreciate it. We want to plan it and so some hints and tips would be gratefully received and you can comment on here or email me .... thank you. am thrilled with it so here it is in all its finery ..
Well what do you think? its a rare find and I am very pleased with this beauty ... This is going to be made into something special but for us to keep. I love that button, it reminds me of a new moon. It is beautiful isn't it, you can see on the back of it the chisel marks from hand carving and the original shell .. I love sand dollars and you may remember that I went hunting for them in America and then realised what had to be done to preserve them so ending up going to a beautiful shell shop there and buying lots to bring home! they all got here in one piece.